The universal power, pure nature and vast potential of the Kundalini seems to have been well understood by the ancients. 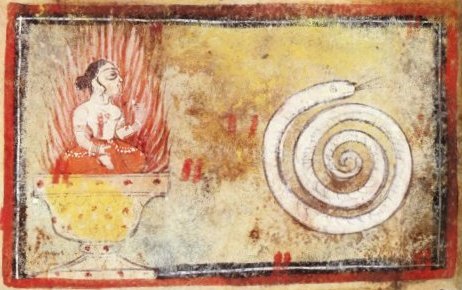 Often it was symbolized as a serpent coiled in three and a half circles with its tail in its mouth, and spiraling around the central axis (sacrum or sacred bone) at the base of the spine. Kundalini is a Sanskrit word literally meaning “coiled serpent”. Over a period of thousands of years, this sacred energy of creation can be found in esoteric teachings from civilizations as diverse as the Egyptians, Tibetans and Chinese. The Upanishads (teachings of the masters), the sacred Vedic scriptures dating back to a period between the tenth and fifth centuries B.C., provided the first known detailed description of this phenomenon, but engravings of yogi-like figures, predating these scriptures by 3,000 years or more, have been discovered by archeological digs throughout the Indus valley. and lies resting half asleep as the base of the body. Going back even futher to the earliest days of human civilization on the Indian sub-continent, Kundalini Yoga was believed to have first developed and then flourished in remote monasteries within the mountainous regions of Northern India, Nepal and Tibet, being passed along by oral tradition from master to disciple. 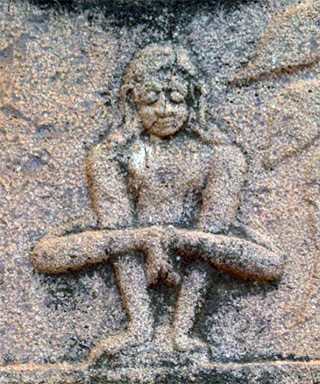 Driven by a goal of finding their higher selves, rishis (seers or sages) systematically tested and perfected the precise movements, postures, sounds and breathing techniques that awakened the serpent, manifesting its powers to produce specific and sometimes profound results in various parts of the body and brain. Back then, prior to the development of organized religion, there were no artificial barriers placed between man and God. Yoga was regarded as a sacred spirit-body connection. There were no yoga mats, yoga fashion gear and all the other seemingly frivolous trappings of modern society. The goal was not fitness. Rather it was direct connection with Brahman, the Universal Spirit within us. Because of its power, Kundalini was considered the most sacred form of yoga. It was not taught publicly – indeed this was strictly forbidden. Each hand-picked students had to undertake years of initiation before they could prove themselves ready to learn the spirit-body lessons from their Kundalini master. This powerful science was kept well hidden from public gaze. The ordinary people were unprepared, it was believed, to access or assimilate such knowledge. This veil of secrecy was rigorously maintained right up until one day in 1968, when a proud Sikh named Harbhajan Singh, aka Yogi Bhajan, a master of both Hatha and Kundalini Yoga, boarded an airplane with a one-way ticket to Toronto.